September 14, 2017--Currently doing lots of stitching, but there's nothing I can write about. The projects I'm working on are for the 2018 ANG Seminar in Washington, DC. But what I can write about is the 2017 ANG Seminar in Anaheim, CA I attended from August 24th through September 2nd. Took two wonderful classes--the first with Cynthia Thomas on how to use Excel to write stitch guides. A few years ago I wrote a stitch guide for a drawn thread class I gave to Delaware's Seashore Chapter (click here). I used software that was .jpg based and once the work was saved, could not make changes. A very cumbersome process. Using Excel would have been so much easier. Now I know. 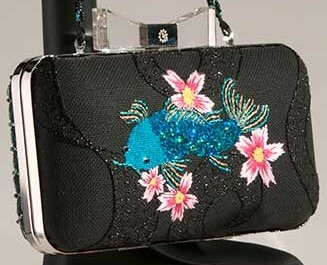 The second class was Coy Koi, a needlepointed purse by Janet Zickler Casey. Not only did we learn how to work the front and back sections, Janet also showed us how to mount the canvas on the pre-formed "clam shell" style purse form which was included with the class kit. I can't wait to blog about this one. Will take a break from 2018 Seminar stitching to work on Christmas ornaments soon, so that will be fun to write about. In the meantime, my cable TV company, Verizon Fios, has given me free HBO streaming through November 30th, so DH and I are binge watching GOT, seasons 1 through 7. We're currently up to season 4 and all I can say is WOW! Is that a good WOW or a bad one lol? I can't wait to see what you think of the finishing process for the clam shell. Have you seen the Craftsy class? I watched a bit of it on Labor day and would be very curious to know if your instructions uses the same method. It's a good WOW (or as a friend of mine would say--a "holy crap" WOW). I didn't know there was a Craftsy class on covering clam shell purses. Where would I find it? Thanks.